You may want or need to contact someone via email but discover you don't have his email address and no one else you know has it either. While there is not a universal directory for email addresses, there are several ways to find someone's email address on the Internet for free, especially if you know the person's first and last name. If you know the host of the email address -- the part between the at sign and ".com" -- go to that domain. Enter the first and last name of the person whose email you want to obtain into the member search box, if there is one. Common names will yield a greater number of search results. If the person's first or last name has a nontraditional spelling or the name is uncommon, you may have more luck. Check a previous email message for clues. Open the message and locate the "From" field at the top. There you will find an email address. For example, the "From" field could indicate that the email address is from johndoe@msn.com. Send a message to the email address; if you receive a message stating that the message was "Undeliverable," the email address is no longer active. In this case, go to the MSN Web site and use the member search link to see if he opened a new MSN account. If that does not work, try inputting the name used for the old address at other domains, such as Yahoo and Gmail, in case he changed hosts but kept the same name. 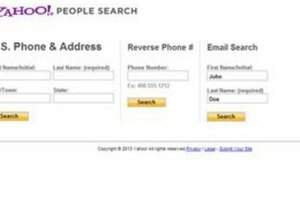 Use the Yahoo People Finder. Enter the person's first name and last name and click "Go." The directory will provide a list of e-mail matches associated with the first and last name you enter. For example, a search of "Jane Doe" could yield the following matches: "Jane_doe@hotmail.com," "JaneDoe@msn.com," or "Jane.Doe@yahoo.com." The directory is not limited to Yahoo users. Perform a Web search. Open a Web browser and type the first and last name of the person. For example, type in "John Doe" putting the first and last name in quotation marks. By enclosing the first and last name in quotation marks, the engine will search the name as a whole instead of isolating the first name ("John") and last name ("Doe") and yielding information associated with the singular words, John and Doe. Use a corporate domain. If you know where the person works, you could attempt to send a message to an email address at the corporate domain or try searching the company directory for the person's email address. If the person works at Domain Name, his email address could be "firstname.lastname@domainname" or "firstname_lastname@domainname," for example. Use one of the leading social networking websites to search for someone. Look for the person by name by visiting Facebook, Twitter, Google Plus, LinkedIn or Classmates.com.